The certification is used to benchmark the quality and standard of those teaching Chinese language anywhere in the world. Why do you need the CTCSOL? 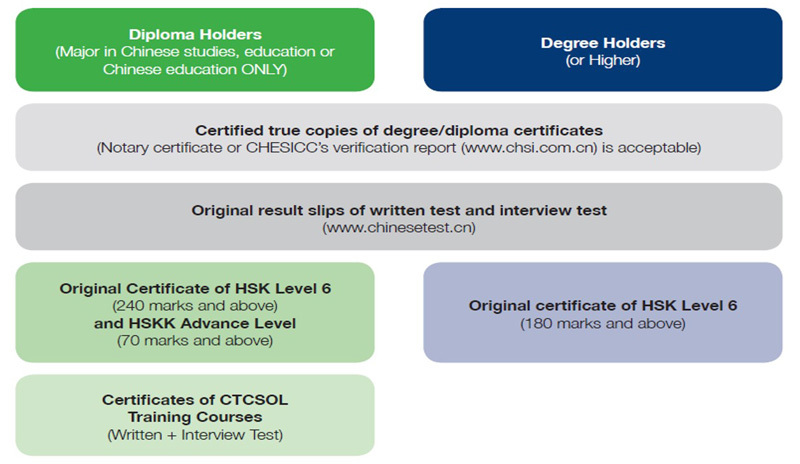 The CTCSOL serves as an important qualification reference for educational institutions in their assessment and recruitment of Chinese language teachers. This gives you a leg up on other applicants / candidates. CTCSOL benchmarks you against global standards. This endorsement of higher quality gives you a definite advantage when it comes to securing a position or promotion in your career. The CTCSOL is the only certificate recognised by Hanban for teaching the Chinese language in the 1500 Confucius Institutes and Classrooms in more than 132 countries around the world. This gives you immense global job accessibility and mobility. The CTCSOL is a testimonial to your higher quality / ability in teaching the Chinese language. This allows you to command a premium when it comes to negotiating for jobs or projects. Candidates may check their scores at www.chinesetest.cn 20 working days after the written or interview test. Only those who have successfully passed both the written examination and the interview can receive “Certificate for Teachers of Chinese to Speakers of Other Languages”. The written test scores of candidates who have passed the written test but failed the interview test remain valid for 2 years. HSK Centre (Crestar) offers a series of training courses to better prepare candidates for examinations. How do you apply for the CTCSOL Test? Visit the HSK Centre (Crestar), bring along your personal identification (passport/ IC), a photo and submit these together with a completed application form and payment. Payment can be made by cash, cheque or NETS card.